Heady Days for Neil deGrasse Tyson: Astrophysicist Gets His Own Beer! The Asheville Brewing Company has named a new beer in honor of famed astrophysicist Neil deGrasse Tyson. Neil deGrasse Tyson has plenty to raise a glass to this month. Not only did the famed astrophysicist become the first American to receive the Stephen Hawking Medal for Science Communication on Tuesday (June 6), but he's also getting his very own beer, courtesy of the Asheville Brewing Co. in North Carolina. 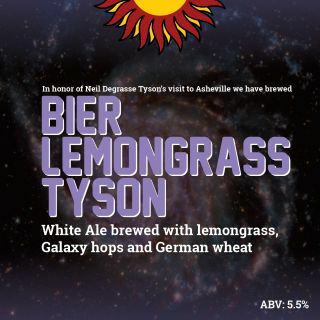 An American version of the Belgian witbier, the Bier LemonGrass Tyson will debut on July 13, the same day Tyson rolls into Asheville for "An Astrophysicist Goes to the Movies," his talk about the real science behind such movies as "Star Wars," "Gravity" and "The Martian." "We wanted to make a beer to celebrate science and to honor one of science's rock stars coming to our town," Mike Rangel, the microbrewery's president, said in a statement. Tyson will appreciate that the Bier LemonGrass Tyson, which contains 5.5 percent alcohol by volume, is brewed in Asheville. Rangel's team distilled the beer using German malt, Belgian yeast, lemongrass, coriander and sweet orange peel. In a clever nod to Tyson's field of expertise, they also dry-hopped it with a cultivar of hops known as Galaxy. "The pronounced fruit notes of Galaxy hops softens and balances the spice character of the Belgian yeast, while the lemongrass and orange peel add a layer of complexity to the flavors," said Pete Langheinrich, the company's head brewer. The beer will be available on draft and in a limited number of 22-ounce bottles at the microbrewery's north and downtown locales. As a bonus, a dollar from every pint and bottle sold will benefit the new Asheville Museum of Science. "We heard you, Neil, and we made this beer for you!" Rangel said.